Looking for the best of both worlds? Look no further than our range of mixed fuel hobs which combine the modern efficiency of an induction hob with the traditional control of gas burners. Some of these models feature flexible induction zones which track where the pans are anywhere on the zone, allowing you to use multiple pans but with individual control over all of them. Look out for models with a high power wok burner which is ideal for the perfect stir fry while your noodles are simmering gently on an induction zone. 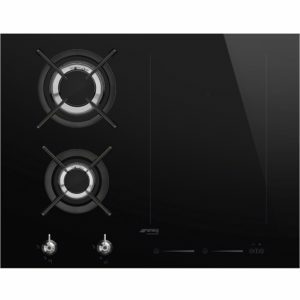 This superb 90cm wide mixed induction and gas hob from Smeg boasts 2 multizone induction zones and a powerful gas burner. So you can choose between gas or induction with the added flexibility of creating a larger induction zone by combining the 2 smaller ones. Finished in frameless black glass it looks fantastic in a streamlined kitchen. Wow! 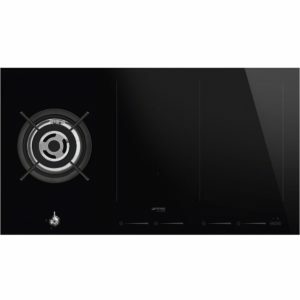 This superb 65cm wide mixed induction and gas hob from Smeg boasts incredible flexibility for cooking with a multizone induction zone and 2 gas burners. Cast iron pan supports over the burners hold pans steady and when you choose to use the induction zones you have brilliant control with slider touch controls. Plus the two induction zones can be combined into one large area, perfect for larger pans. Finished in frameless black glass it has a modern and distinctive style. Smeg always impress and this superb 75cm wide mixed induction and gas hob boasting a multizone induction zone and 2 gas burners really shows why! Not only the fine control of gas, you can also cook with the super efficient induction zones that only heat as they detect pans thanks to their automatic pan recognition. Plus if you need to use a larger pan that's no problem with the option to combine the induction zones. Amazing. With a frameless black glass design it looks fantastic in a modern and sleek kitchen. 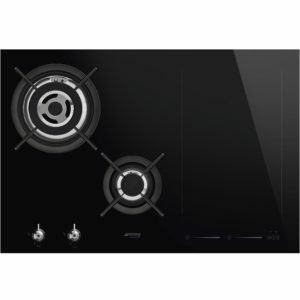 If you want to look at your other options head to our full range of hobs. You’ll find it in our cooking section, alongside our range cookers and built in ovens. If you need a new cooker hood to match, we have powerful hoods that go with our powerful hobs in our extraction section. For more great kitchen appliances, head to our refrigeration and small appliance sections. We’ve got everything you need to fully kit out your kitchen with some of the best models from market-leading brands. A house needs great appliances to run smoothly, and that’s what we specialise in here at Appliance City. See if you can’t nab yourself a deal or two today!